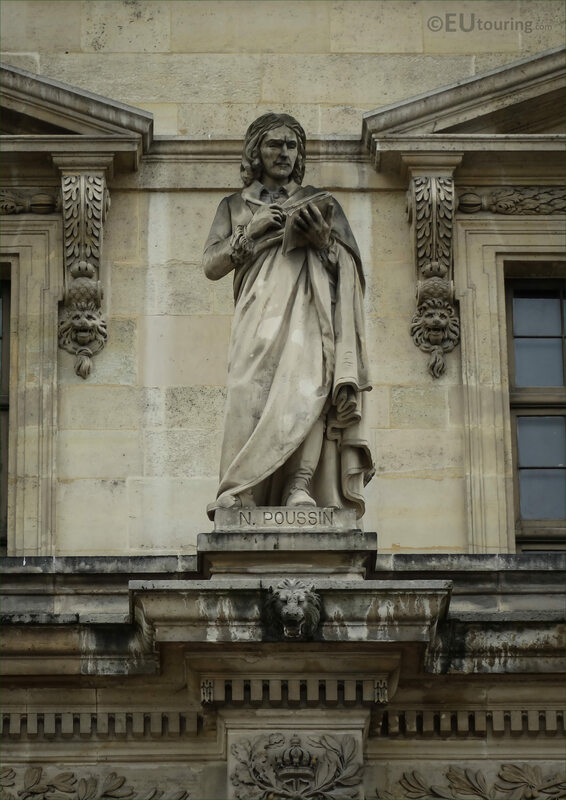 There are so many statues to discover on the facades of the Palais du Louvre without even entering the museum, so yet again we were within the Cour Napoleon looking at the Aile Mollien and these high definition photos show the statue of Poussin by Francois Rude. So as you can tell from this HD photo, the Nicolas Poussin statue is positioned on a balustrade in between the windows on the first level of the Aile Mollien, which is one of the many wings of the Musee du Louvre in the 1st Arrondissement of Paris, and when looking at the facade you will find this positioned third in from the left hand side. 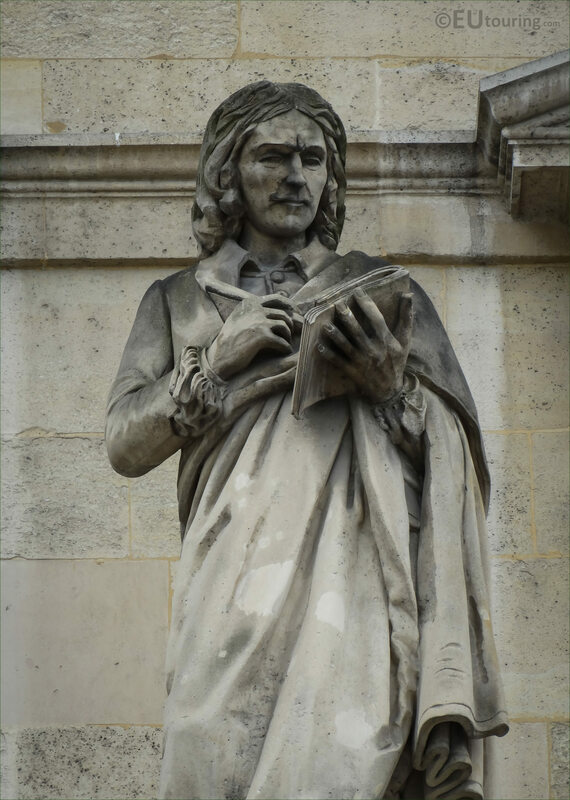 Now this next image shows a closer view of the statue and its impressive detail depicting Nicolas Poussin, which was produced by the famous French sculptor Francois Rude, who was born in Dijon in 1784, yet spent a lot of time in Paris, and after being awarded the Legion of Honour for one of his works, he received several public commissions including the La Marseillaise on the Arc de Triomphe in Paris. 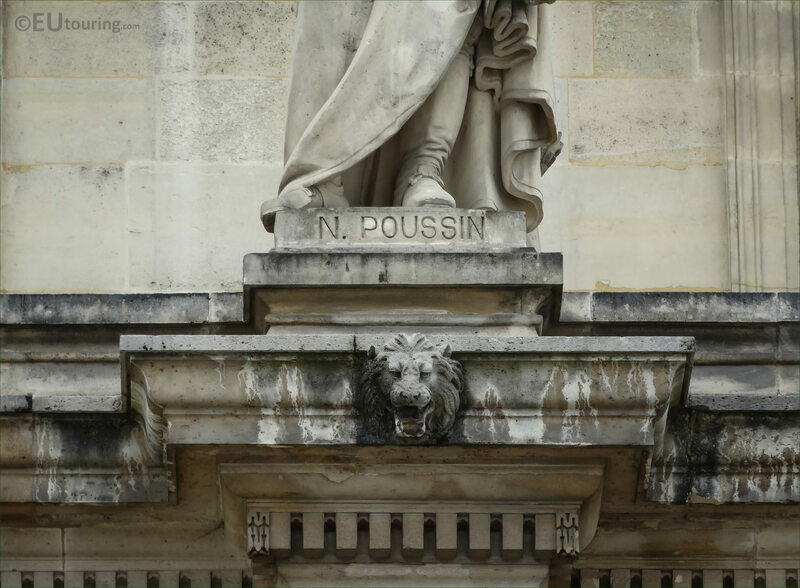 And in this last photograph you can see the plaque at the base of the stone statue, which is dedicated to Nicolas Poussin, who was born in 1594 and became a painter, yet spent a considerable amount of time in Rome, apart from when Cardinal Richelieu ordered him back to France to serve as the painter for King Louis XIII. And over following years he produced numerous different paintings, although he went back to Rome, which is where he died in 1865, but his paintings can still be found in numerous European museums including The Louvre that has the most substantial collection of Poussin works.